CITT is industry's most valued and experienced source of supply chain logistics courses, professional certification and expertise. The CITT-Certified Logistics Professional (CCLP) designation and course of study is relevant to anyone who buys, sells or manages the flow of goods and product, or is impacted by supply chain logistics. 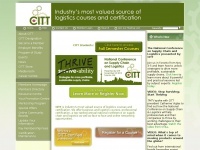 CITT offers six specialized logistics courses, which lead to the CCLP professional credential. We also host Canada Logistics Conference, Canada's annual thought leadership confe ..
two profiles were found for Citt.ca in social networks. Among other social networks the website is represented in Twitter and LinkedIn. The web server used by Citt.ca is located near the city of Burlington, Canada and is run by Korax. The website Citt.ca has a own web server. The web server only runs this website. The websites of Citt.ca are hosted by a Apache server and were developed in the programming language PHP. The HTML pages were created with the latest standard HTML 5. The visitor analysis software Google Analytics is used to analyze the visitors of the websites. The website does not specify details about the inclusion of its content in search engines. For this reason the content will be included by search engines.